Look what I found at Decor4All! Such a lovely idea! “Cross stitch patterns in bright colors can be quickly made with Washi tapes. This fun material and interesting wall decorating ideas allow to create temporary accents on empty walls, beautifying your interior decor. Painter tapes in various colors work well also for these wonderfully simple and creative diy projects. Washi tapes are great for creating star, flower and striped designs on empty walls, furniture and decor accessories. 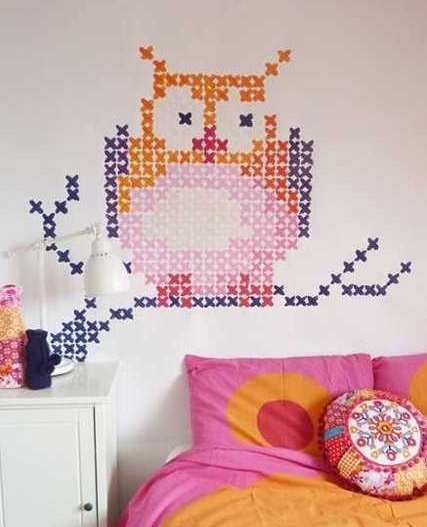 Cross stitches are one of the easiest ways to decorate a wall with colorful Washi tapes. Painting cross stitches on empty walls is another great wall decorating idea and a nice way to add bright colors and stylish cross stitch patterns to your empty walls, creating personalized and crafty room decor.